Jeeps players celebrate after their come from behind victory on senior night. Minford sophomore Livi Shonkwiler attempts a serve in the Falcons road loss to South Webster Thursday night. 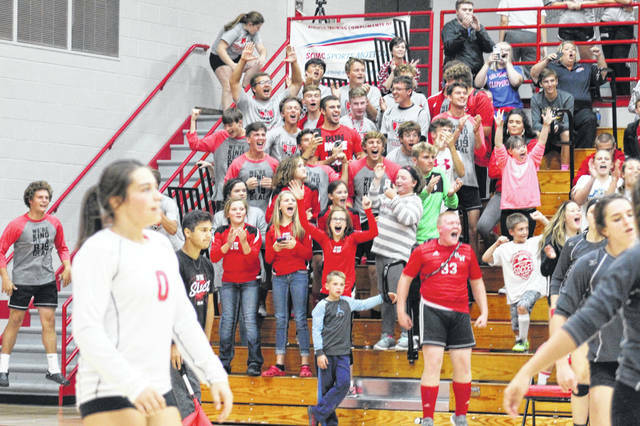 The South Webster soccer team joined the rest of the spectators following their match vs. New Boston to help cheer on their classmates on senior night. 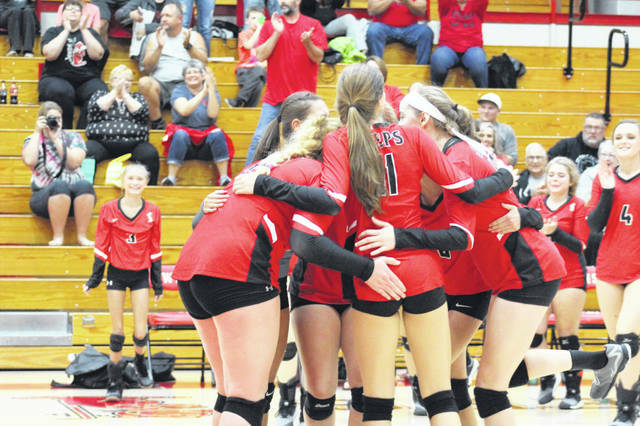 What started out as a night that appeared as if it had the potential for a disappointment ended in a big come from behind victory for the South Webster Lady Jeeps over conference rival Minford in four sets, 23-25, 29-27, 25-18, 26-24. This match just so happened to also be senior night for the four Jeeps seniors: Hannah Spergin, Haley Mason, Taylor Rawlins, and Liz Rockwell. 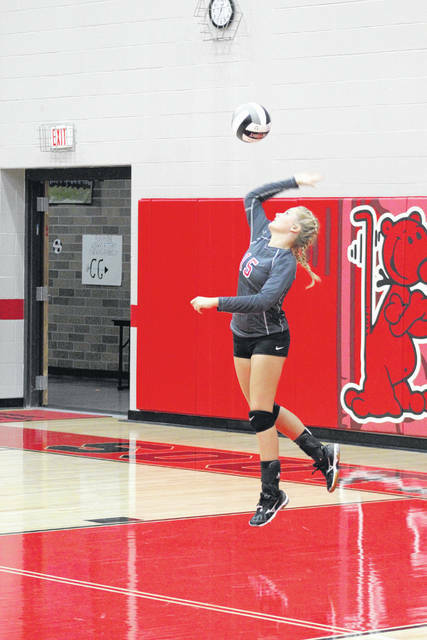 In a very tight first set, things appeared as if they were going to go the Jeeps way as they led throughout the set and held a 21-17 lead in the late stages of the set which forced Minford head coach Rachel Stapleton to call a timeout. Stapleton’s timeout worked as the Lady Falcons were able to score eight of the last ten points in the first set to win 25-23. The closeness of the first carried directly into the second set in what would ultimately be the closest set of the night. In the latter stages of the second, South Webster trailed 19-12 as it appeared that they would go down 2-0 and fall into a pretty big hole. However, the Lady Jeeps were able to score 17 of the final 25 points in the set to win by a final score of 29-27 in a very back and forth second set, particularly in the latter stages. Heading into the fourth set of the night with a 2-1 match lead, the Jeeps were knocking on the doorstep of a very impressive come from behind victory. Leading in the final stages by a score of 20-19, South Webster allowed Minford to score five of the next six points as they took a 24-21 set lead as Claxon used another timeout to try and rally her team. Whatever she said to her team must have been the trigger as the Lady Jeeps came out firing following the timeout to score the final five points of the set to ensure their comeback attempt and win the set 26-24, and the match 3-1 to close out a great senior night performance. Minford will open up their postseason play with a sectional matchup against Portsmouth on Tuesday October 16th at 6:00 p.m. on the Falcons home court. As for the Lady Jeeps, they will host the Piketon Redstreaks on Tuesday night at 6:00 p.m. in their opening round sectional matchup. For Claxon, the key for her team moving forward into next week’s postseason play is to continue their intensity and continuing to do the things they’ve been working on.